Going abroad may seem nerve-wracking, exciting, and just a mix of emotions. This was my first time out of the States (excluding Puerto Rico). Since I was 12, Spain was my number one bucket list item. Two weeks wasn’t enough but I can say that it was worthwhile. I came in with no expectations other than adventure..and that’s what I got. One of my goals and aspirations in life is to be as well traveled as I can be but also somehow make an impact wherever I go. Volunteerism is a huge part of my life. (Of course, still not really sure how to do that quite yet but it’ll come to me.) I guess after fours years of studying and working dulled me a little but interacting with the locals really fueled my fire and sparked my passion all over again. I believe that in order to understand people and culture is to experience it for yourself. You can study it in books or watch documentaries but it is completely different from personal experience. During my alone time, mostly on the bus when everyone was asleep, I would sit there and think. I guess car drives are when I think the best. 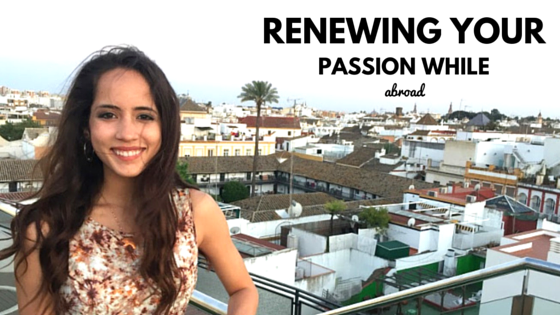 Almost everyone in Spain is passionate whether it is their career, family, a hobby. With a new career soon to begin (one week), I couldn’t be more excited to bring the same amount of passion I saw in Spain into my own career. I also couldn’t be more excited to save money and travel the world; who knows maybe my career will include travel as well! There are so many things I want to do and eventually, I want to have so many stories to tell.